Tuesday 13th October, 8pm Scientific Methods in Archaeology. Lecture by Dr. Caroline Cartwright. Caroline Cartwright’s primary areas of scientific expertise cover the identification and interpretation of organics such as wood, charcoal, fibres and other plant remains, shell, ivory and bone from all areas and time periods in the British Museum’s collection. Tuesday 10th November, 8pm The History of the Royal National Lifeboat Institution. Lecture by Keith Cunningham. Tuesday 9th February, 8pm Medieval Middlesex: The Archaeological Remains. Lecture by Adam Corsini. Tuesday 8th March, 8pm Crossrail Archaeology Project. Lecture by Jay Carver. Few people are aware that in the leafy suburb of St Margaret's, southwest London, there is a delightful house designed and built for his own use by the great landscape painter J M W Turner, RA. That's partly because until about five years ago, the property was in private hands, and although the house is now owned by a charitable trust, it's rarely open to visitors. In 1807, at the age of 32, Turner bought two acres of farmland on rising ground, about half a mile from the Thames and with views northeast over the river to Richmond beyond. It backed onto a muddy lane called Sand Pit Close (now Sandycoombe Road), and was built close to it, this being the highest part of the estate. Turner was his own architect, his designs evolving through many sketches in his notebooks. The house was intended as a rural retreat from the pressures of his gallery and studio in London's Harley Street, and also became the home of his father, a recent widower, who kept house for him. From the time he bought the land in 1807 to the time he sold the house in 1826, Turner explored and enjoyed the local landscape. He took his boat along the Thames, walked the riverside paths, and climbed Richmond Hill with its famous view over "the matchless vale".Turner loved fishing, and was often accompanied by his close friend, the architect John Soane. Some architectural features of Turner's house, like the cantilevered staircase and oval rooflight, seem to have been influenced by Pitshanger Manor in Ealing, Soane's own home that he had bought and rebuilt a few years earlier.Many of Turner's most famous paintings date from this time, inspired by the Thames, notably Thomson's Aeolian Harp (1809) and England: Richmond Hill, on the Prince Regent's Birthday (1819). (The Prince Regent’s official birthday, 23 April, was also Turner’s birthday, Shakespeare’s birthday, and St George’s Day.) Mr Turner's house consists of a broad-eaved two-storey cottage containing the drawing room and corridor, with single-storey wings each side for the dining room and parlour, with kitchen, scullery and coal cellar in the basement, plus what looks to me like a wine cellar under the stairs. Later alterations added a second storey to each wing and a conservatory to the rear of the house.The estate is much smaller now. The garden at the back of the house has a number of large trees, and these and subsequent housing development have rather spoilt the views over the Thames.Used a private home for well over a century, Sandycoombe Lodge was requisitioned in World War II as a 'shadow factory', making gloves and uniforms for the RAF. The fabric of the house may have suffered during this time, and refurbishing is clearly needed (the house is currently on the Heritage at Risk register).In 1947 the house was purchased by Professor Harold Livermore and his wife, who carried out some restoration and cherished the property and its connections with Turner for over sixty years. On the Professor's death in 2010, the house was bequeathed to the Sandycoombe Lodge Trust to be preserved "as a monument to Turner in Twickenham". A GLC Blue Plaque by the front door commemorates the link with the famous painter. If you'd like to visit, you'll need to be quick. The house will be open on Saturday 26 and Sunday 27 September, 11am–5pm (free entry) and on Saturday 3 October, 2pm–5pm (guided tour £4). That is it for this year and next, for a programme of restoration and conservation means that the house will be closed for at least the next eighteen months.Turner’s House Trust is leading a fascinating project to restore the house to its original appearance, open it to visitors, and set up a programme of activities to involve people of all ages. Following Stage 2 HLF funding of £1.4m in January 2015, the project still needs to raise £290,000 to complete funding.The address is 40 Sandycoombe Road, St Margaret's, Twickenham TW1 2NQ; St Margaret's station with frequent trains from Waterloo is very close. The habit of leaving graffiti is not a modern one. These two pictures appear to indicate that a certain ‘WP’ visited Breamore in 1694 and Minstead in 1738. I wonder how many other places ‘WP’ defaced with a ‘tag’ between these dates? The dig took place 8th-12th June on a public green area bordered by Cromer Road and Shaftesbury Avenue, New Barnet, Herts, EN5 5HT. Grid ref TQ 25994 96482 the site code is CRS14 (2015). The site is opposite Cromer Road School where we dug in 2014. For background info please see the Cromer Road School article in HADAS Newsletter 524 and Melvyn Dresner’s article in Newsletter 533. Whilst digging at the school in 2014 we noticed a strong set of ‘parch-marks’ out on the green. Local enquiries told that this building (now demolished) had been known as the ‘blood bank’ (National Blood Transfusion Service), however, this was not the full story. The parch-marks were noted on aerial-photographs and from further research the building itself could be seen on a series of other aerial-photographs (i.e. 1946 RAF). 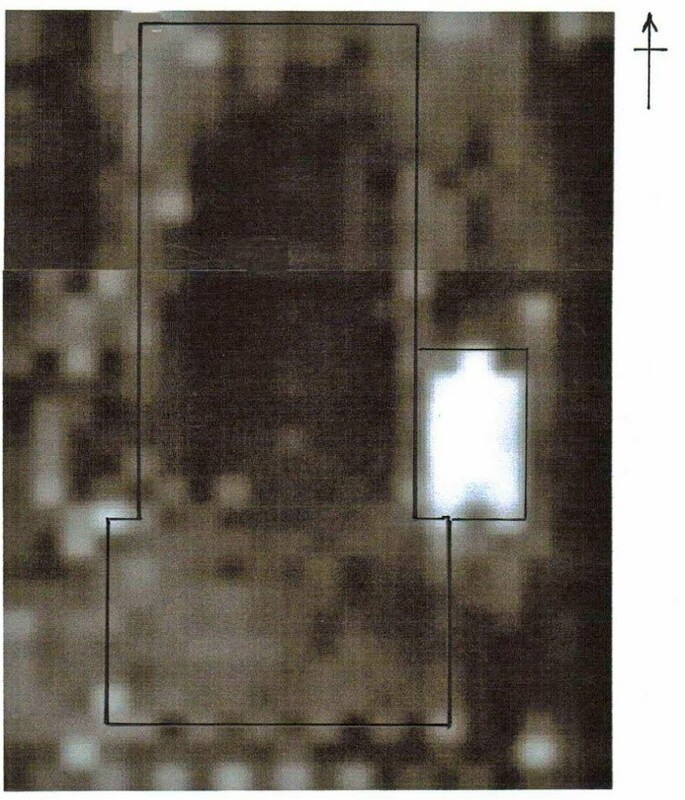 A resistivity survey was undertaken which confirmed the ‘T’ shaped structure which was approximately 30.00m NS x 12.00m EW (main building block). The photos and survey also point to other outbuildings, open sheds and a very high resistance rectangular area to east of the main building. Two trenches were opened-up and a programme of local walks and fieldwork techniques were provided for the primary school children of Cromer Road School. This 3.00 x 1.00m was opened over a ‘T’ shape junction of the building and was used mainly for the young students to get some experience of excavation. Immediately, mortared brick footings began to appear (at 66.06m OD), pale-red stock bricks laid in English-Bond style these included footings of the main (dog-leg) wall of the structure and other external walls. The trench was not bottomed or the foundation seen but six courses of the brick footings were excavated. The footings were surrounded by context  topsoil excavated in parts to a depth of 0.68m. Evidence for light-weight roofing material (left in-situ) was seen at the bottom of the trench indicating the ‘lean-to’ and shed nature of some of the external building. A concrete floor level (65.99 OD) may have been reached in the SE corner of the trench, with some further brick footing perhaps forming internal walling. Throughout trench 1 contexts, there were small amounts of bottle and window glass, small amounts of post-medieval earthenware (Transfer Printed Ware, Stoneware, Tinglaze) and porcelain pottery. Small amounts of roof slate, and corroded iron fittings. There was more in the way of red-tile – 82 sherds from all trench 1 contexts. A fair amount of brick and concrete rubble was excavated from the trench, this was not quantified but some was retained as samples and recorded. Context : 1 piece of pink rubber tubing - possibly connected with a ‘giving-set’ a blood/plasma transfer kit. 2 x pieces of clay tobacco pipe stem. Context : 1 piece glass syringe (small find 01), ‘giving-set’ as above. Several small yellow glass spheres, possibly connected with a ‘giving-set’ as above. This was placed over the strong rectangular (7.00 x 3.00m) signal seen in the resistivity survey and also seen in the parch-marks, this indicated a high resistance – something hard and solid. Deturfing of the 3.00 x 1.00m trench soon revealed the main NS wall (66.07 OD), with some bricks impressed - of interest are the bricks stamped with 'LBC', 'PHORPRES' and '10'. These bricks are Flettons made by the London Brick Company. The PHORPRES refers to the method of manufacture where the bricks were pressed four ways which was formulated in the late 19th century. The 10 refers to either a kiln number, or a site number - there were many LBC sites, including those in Buckinghamshire and Cambridgeshire. This type of brick ceased manufacture in 1974 (D Cooper – pers comm.). The demolition fill consisted of a compact sandy/gravelly context  with much demolition rubble including brick, tile and hefty lumps of concrete. Excavation of  to the west of the wall uncovered a concrete ‘threshold’ leading to 2 rendered steps leading down to a smooth concrete floor (65.66 OD) of a shallow sub-basement or chamber, a depth of only 0.41m from threshold to floor, what was going on? There was also a less substantial EW single line brick wall to the south of the trench, probably a partition wall. 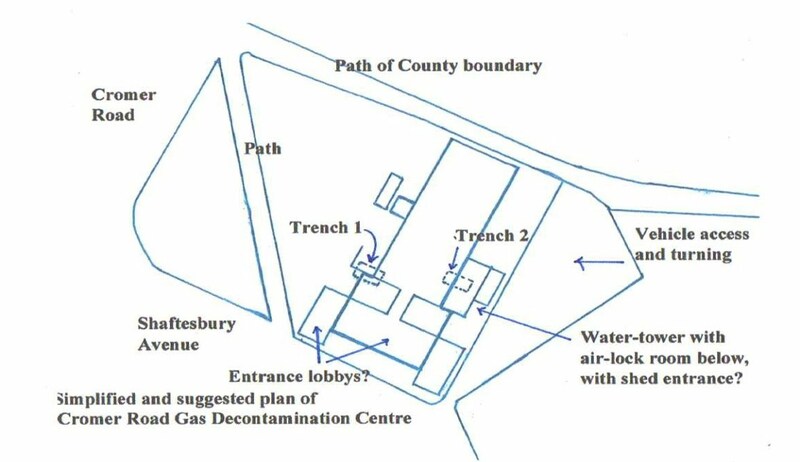 Some quick research by Melvyn seemed to show we were digging in an air-locked room that was part of a Gas Decontamination and Cleansing Centre (see below). As we excavated through the rubble to the floor other finds began to emerge. A number of heavily corroded small metal-boxes were found on the floor of the chamber together with electrical lamp fitting and the corroded frame from an item of furniture. An iron-pipe was found running NE-SW across the chamber slightly suspended above the floor, the SW end was open, the NE continuing into the baulk. The use of this pipe is a mystery, it also cuts across the bottom step at an angle, and somebody made a neat job to accommodate it. This pipe clearly post-dates the building of the chamber. To the west of NS main wall, the trench was excavated down through the topsoil and sandy pebbly clay which contained several pieces of brick rubble and some large sections of concrete with surface finishing, probably floor or ceiling sections. Natural was encountered at approx. 0.60m below turf level. The main wall footings consisted of 5 mortared courses laid in English Bond style resting on plinth of bricks dug into the surface of the natural. Throughout the trench 2 contexts there were small amounts of bottle and window glass, small amounts of earthenware and porcelain pottery. Small amounts of roof slate, red-tile and corroded iron fittings. As in Trench 1 samples of building material were taken but not quantified. Context : 1 flint crested bladelet, possibly Mesolithic (small find 02). 1 washer (small find 06) possibly connected with a ‘giving-set’ a blood/plasma transfer kit. 1 iron (?) pin (small find 05). 1 small glass tube or filament (small find 07). 1 piece of perished hose (small find 08) possibly connected with a ‘giving-set’. Lamp electrical fittings and shade. 12 metal-boxes with a tinned surface, 150mm long x 55m wide x 15mm deep, thought to be ‘giving-set’ boxes. Others were left in-situ on the floor of the chamber. An iron framing with springs found with degraded wood which was connected to a metal folding bracket. Possibly the remains of a fold-down bed/chair or similar furniture. Context  west: 1 clay-pipe bowl fragment (small find 09). Type AO27, date 1780-1820, spur initials (?)W-I. “We cannot find a WI for those dates on the London/Middlesex/Hertfordshire pipemakers database.” (D Cooper – pers comm.). The earliest object found was the Mesolithic flint bladelet. “Can be described as part of a crested bladelet because of the little flake scars running down one side. From its size, it certainly looks typically Mesolithic but in the absence of any other Meso material it cannot be proven.” (M Stewart – pers comm.). The site lies on the Hertfordshire side adjacent to the old County Boundary between Hertfordshire and Middlesex, a footpath currently follows the route. Maps indicate this area of New Barnet was relatively undeveloped in the late Victorian period being of open fields (Landmark Information Group, 1860s and Godfrey Edition maps 1898, Monken Hadley). 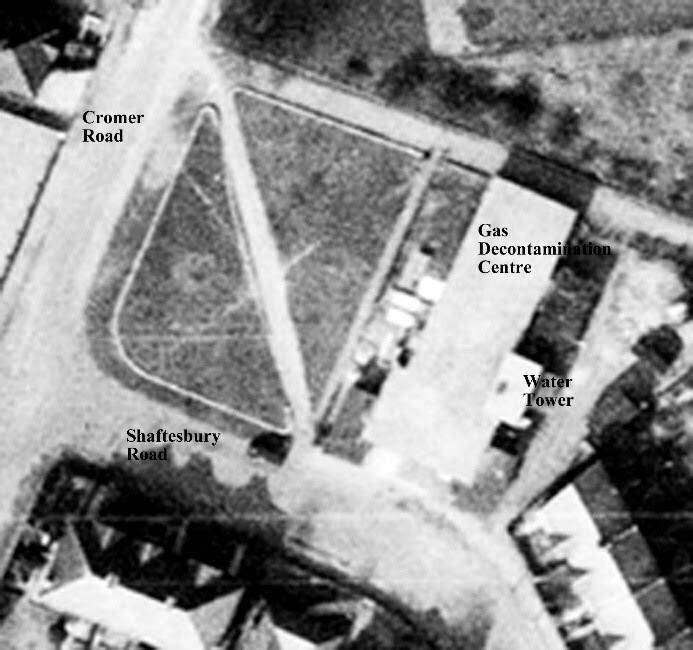 By 1910 the lines of Cromer Road and Shaftesbury Road had become extant. The indications are that although nearby housing was developed by this period, the ‘green’ where our site is located seems never to have been built on pre the late 1930s. As with the Cromer Road School dig in 2014, there is a scatter of red-tile, small amounts of 17th-19th century pottery and c1800 clay-pipe finds. These could be the signs of previous farming activities and/or demolition in the nearby area or possible foot-traffic along the boundary route or part of the soil brought in to backfill and level the area in the 1970s. These were built in numbers around London in the event of a gas attack. We have a reference to several National Blood Transfusion Service Depots being “amalgamated in High Barnet in a converted decontamination centre” in 1946 (Welcome Library ref: SA/HHC/Q North London), although there is no direct reference to Cromer Road, it must be highly likely that this is the site. Put together with the plan of our structure, the single storey and flat roof, and also the distinctive shape of the tower containing a water tank and possible chimney, we quickly realised what we were dealing with – the air-lock and foundations of the tower. The GDCs were never used in practice and some were converted to other uses – first aid post, air-raid shelters etc. As mentioned above the Cromer Road building was taken over in 1946 if not before by the National Blood Transfusion Service. On the floor of the air-lock chamber were scattered a number of small metal-boxes, archive photos show these as containing a mixture of needles, glass syringes, tubing, holed-washers, connectors etc. Although our metal-boxes were empty but we believe we have found some of the type of contents that would have been in them. 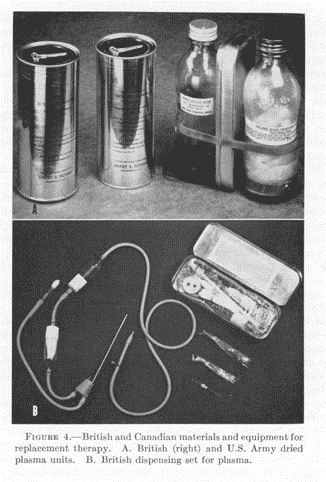 In some cases these were known as ‘giving-sets’ for replacement therapy and for dispensing plasma and blood products. They are shown being packaged with tinned-blood and dried plasma units to be delivered and used in the field (see Melvyn’s article below). The chamber also contained domestic lighting equipment and possible fittings of a fold-down chair or bed, had this been converted into a small surgery? In 1952 National Blood Transfusion Service depot moved to Edgware and Colindale, the subsequent use of the building is unclear, maybe a store. We have some photos taken in the NE corner classroom of Cromer Road School in 1968, this shows principally class activities but through the window can be glimpsed the western side of the GDC on Shaftesbury Avenue, an entrance door can be seen (main office entrance?) together with the water-tower and short chimney on the eastern side. These are the only ground level photos we know of at present. Maps indicate the GDC structure may have been still standing in the early 1970s. Acknowledgements: Many thanks to Don Cooper, Melvyn Dresner, Angie Holmes, Jim & Jo Nelhams, Susan Skedd, Cromer Road School, Myfanwy Stewart and the HADAS Fieldwork and Post-excavation teams. Centre at Cromer Rd/Shaftesbury Avenue. See main text for scale. GDC building and water-tower (right). 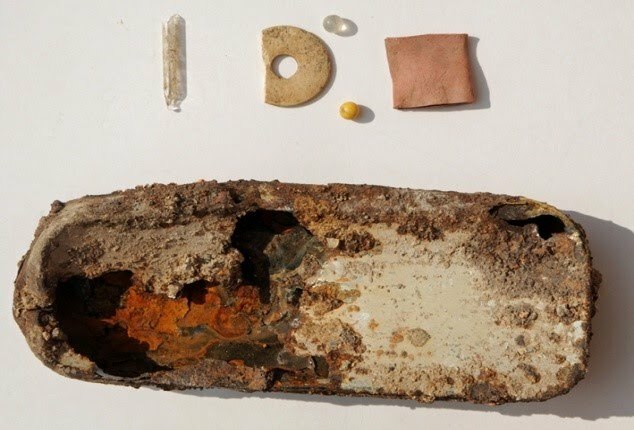 We found empty tins and other fragments (gauze, rubber, glass) at Cromer Road School dig that link us to the story of blood transfusion and war: a story vital to understand the ingredients of victory are not just superior firepower: living people win wars. The collection of blood in preparation for war begun 3 days before the war started by a telegram: START BLEEDING sent by the Medical Research Council to Dr Jane Vaughan in 1939. Vaughan had championed the idea of blood banks in face of political scepticism. She was working at Hammersmith Hospital and held meetings to promote the idea at her flat in Bloomsbury and lobby government. The science of blood transfusion and its storage was in its infancy in 1939. The Medical Research Council had begun research in the 1920s and the army service were organised in 1938. MRC built its research centre in Mill Hill in the 1930s though during the war it was as a depot for Women’s Royal Naval Service. In the 1920s, the British Red Cross organised the first volunteer blood donors’ transfusion direct to patient in 1921. It was expertise learnt during the Spanish Civil War that led to the creation of blood banks. Republican Dr Duran-Jordan had set up blood banks in Barcelona during the civil war. Franco’s nationalist forces defeated these Republicans in 1939. Duran-Jordan took refuge in London working with Vaughan at Hammersmith Hospital. This inspired her setting up 4 Blood Supply Depots on the periphery of London following the ‘START BLEEDING’ telegram. The Luton and Slough depots were merged on the Cromer Road site after the war before being transferred to Edgware Hospital in 1952 where it remained until 1989. Vaughan worked at Slough depot during the war covering North West London and later as Principal at Somerville College, Oxford where she taught Margaret Thatcher and Shirley Williams and published over 100 scientific papers. Brigadier Whitby speaking to the Royal Society of Arts during 1945 explained how much individual donors were giving, some 50 pints each and over 2,000 giving 10 pints, and one person giving 100 pints during the war years; an average person holds 7 pints in their body at any one time. (Left) Welcome Library photo of ‘giving-set’ boxes and contents, also blood and plasma containers. (Above) Cromer Road box and possible contents. The Wellcome Library (SA/HHC: Harrison-Howell Blood Transfusion Collection) includes archives related to the National Blood Transfusion Service and Army Blood Supply Depot including the file on North London mentioned above. Maureen Owen, Dame Janet Maria Vaughan, D. B. E. 18 October 1899-9 January 1993, Biographical Memoirs of Fellows of the Royal Society, Vol. 41(Nov., 1995), pp. 482-498, The Royal Society. Rose George, March 2015, A Very Naughty Little Girl: The extraordinary life of Janet Vaughan, who changed our relationship with blood, Longreads http://blog.longreads.com/2015/03/10/a-very-naughty-little-girl/ retrieved: 8/16/2015. <https://en.wikipedia.org/w/index.php?title=Frederic_Dur%C3%A1n-Jord%C3%A0&oldid=675705369> [accessed 18 August 2015]. Encyclopedia, 19 July 2015, 12:50 UTC, <https://en.wikipedia.org/w/index.php? title=National_Institute_for_Medical_Research&oldid=672125369> [accessed 19 August 2015]. Wednesday 11th November, 2.30pm Mill Hill Historical Society Trinity Church, The Broadway, NW7. SSAFA – The First Military Charity in England. Talk by John Ward. Saturday 14th November, 10.30am-3.30pm London Omnibus Transport Society, R.A.F. Museum, Graham Park Way, Colindale NW9 5LL. Autumn Transport Spectacular. London’s largest indoor transport sale. Entry via Halton Gallery, with most stands in Dermot Boyle wing. £3 admission . Wednesday 18th November, 6pm Gresham College at Museum of London, 150 London Wall, EC2Y 5HN. Envy of Kings: The Guildhall of London & The Power of the Medieval Corporation. Talk by Simon Thurley on the architectural patronage of the City’s Lord Mayors from earliest times to the present. Free. Wednesday 18th November, 7.30pm Willesden Local History Society, St. Mary’s Church Hall, Neasden Lane NW10 2TS (near Magistrates’ Court). Frederick Augustus Wood. Talk by Margaret Pratt (Sec) & Cliff Wadsworth (Pres). F. A. Wood was one of the founding fathers of modern Willesden and the most prolific history researcher of the old borough. Wednesday 18th November, 7.30pm Islington Archaeology & History Society, Islington Town Hall, Upper Street N1 2UD. Rejecting War. Talk by Bruce Kent about people who said ‘no’ to war, including Prof. Joseph Rotblatt, Sylvia Pinehurst, Franz Jager-Statter & many more. Visitors £1. Friday 20th November, 7pm CoLAS St Olave’s Parish Hall, Mark Lane, EC3R 7LQ. Embalming in Practice: The Study of Mummies at the British Museum. Talk by Marie Vandenbeusch (BM). Visitors £2. Refreshments. Friday 20th November, 7.30pm Wembley History Society, English Martyrs’ Hall, Chalkhill Rd., Wembley HA9 9EW (top of Blackbird Hill, adj., to church). Crime & Punishment in London. Talk by Diane Burstein. Visitors £2. Refreshments. Wednesday 25th November, 7.45pm Friern Barnet & District Local History Society, North Middx. Golf Club, The Manor House, Friern Barnet Lane, N20 0NL. Back to the Drawing Board – Transport Systems That Failed. Talk by Ralph Hutchings. Visitors £2. Refreshments. Bar before and after meeting. Thursday 26th November, 8pm Finchley Society, Drawing Room, Stephens House & Gardens (formerly Avenue House), East End Road, N3 3QE. All Over by Xmas – Life on the Home Front in Barnet during WWI. Jean Scott Memorial Lecture given by David Berenguer (Chair Friern Barnet LHS & author of book). Refreshments 7.30pm. Non-members £2. Saturday 28th November, 10.15am – 3.30pm Amateur Geological Society’s Mineral & Fossil Bazaar St. Mary’s Hall, Hendon Lane, N3 1TR. Including rocks, books, crystals, gemstones, jewellery. Refreshments. Admission £1.